Chef for a Day and Favourite Things at The Adelphi Kitchen Aberdeen. Like a phoenix from the flames The Adelphi Kitchen rose from the ashes of La Stella. 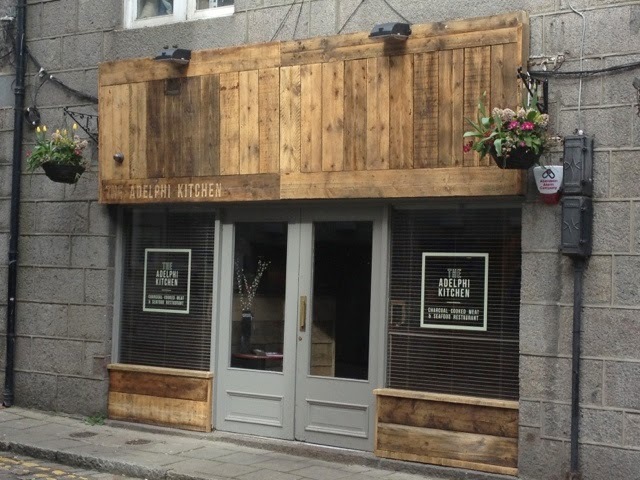 Its arrival on the Aberdeen restaurant scene was hotly anticipated thanks to a clever social media campaign which whipped the city into a frenzy of anticipation with the promise of a charcoal pit, smoking cabinet and dirty steak. The launch party in February lived up to the hype. 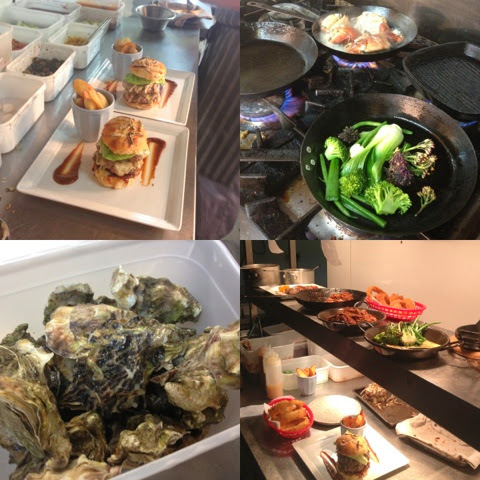 Fantastic atmosphere, decor, menus, staff, food and drink. 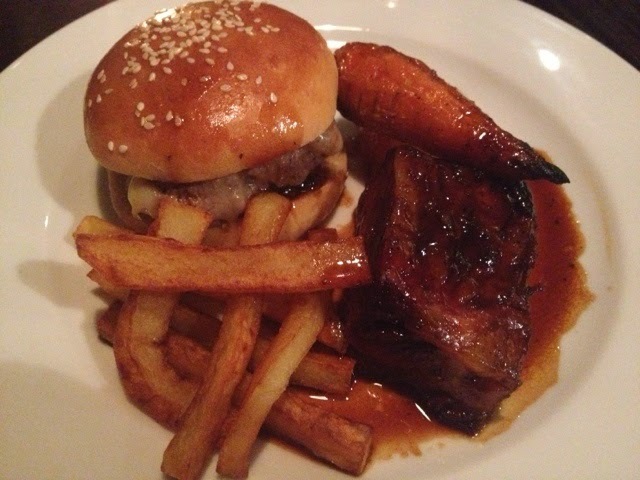 Adelphi overnight became the place to eat out in the city. 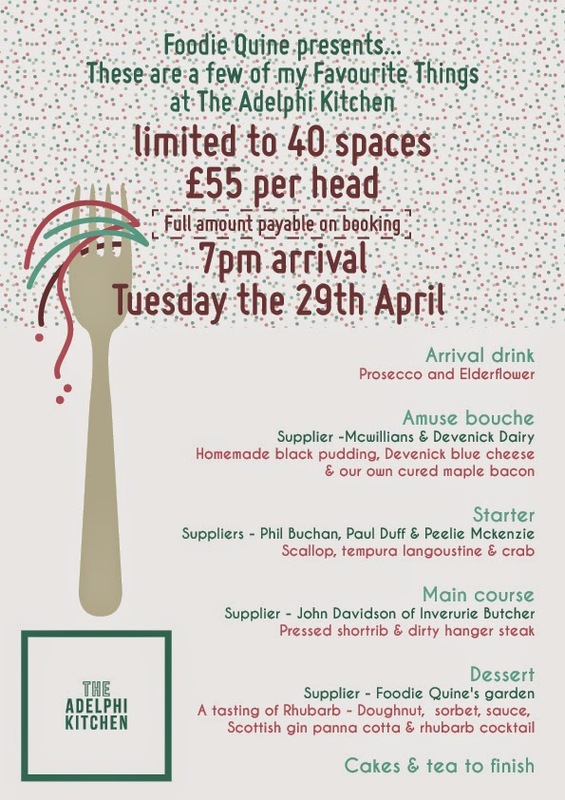 Turn back the clock to June 2013 when I was the highest bidder in a silent auction for a 'Chef for a Day' experience at either La Stella or The Courtyard. When I heard on the foodie grapevine that a revamp of La Stella was on the cards I decided to hold my horses on redeeming my voucher until the reincarnation as Adelphi Kitchen. The day arrived for my experience and I was somewhat nervous. Not helped by my 11 year old son winding me up that it was going to be all Hell's Kitchen like and I'd be in tears out the back. Whites ironed and comfy shoes at the ready I headed to face the music. I got off very lightly as my day didn't start until 10.30am by which time the kitchen was already in full swing with prep for the day. Head Chef Murray wasted no time in setting me to work. 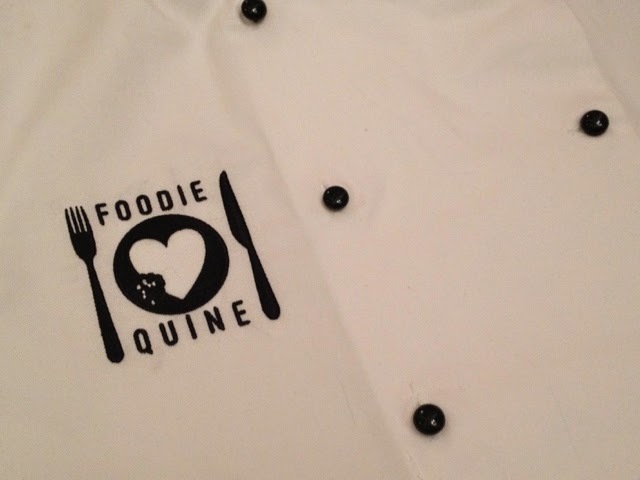 Alas he never introduced me to the rest of the team, cue them having to ask if I had a real name or if they should just call me Foodie Quine. 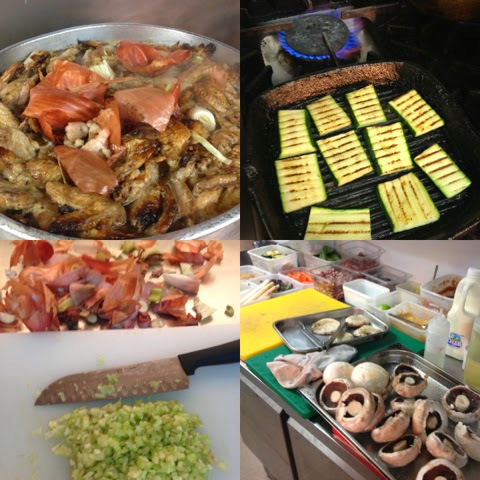 Thomas, Luke, Tasha and José all made me very welcome in the kitchen. Hopefully I didn't get under their feet too much throughout the day. 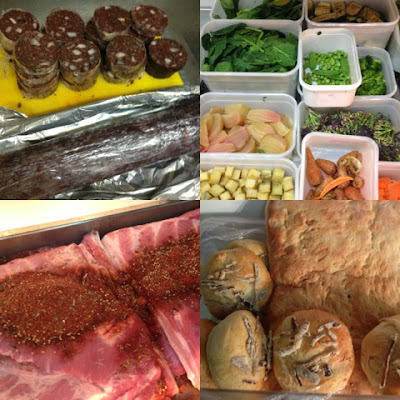 Lunch service began at 12 and up until then it was all about the prep list. Ensuring that everything was in place so that when both lunch and evening service started all was ready to go. 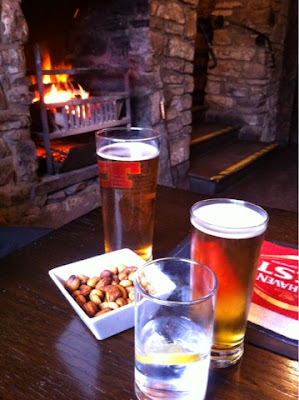 I got stuck in to making black pudding, chargrilling vegetables, lighting the fire pit, prepping stock and pulling pork. Asbestos fingers were required for many of my tasks throughout the day. 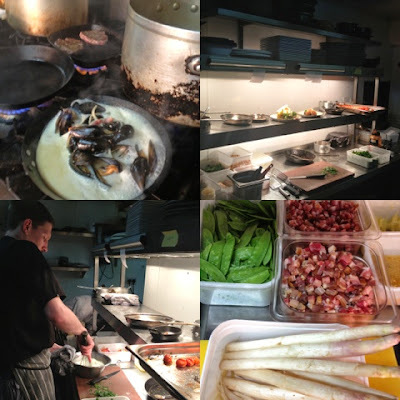 When lunchtime service arrived I was shown how to plate up the dishes ready for the front of house crew to swing into action. Alas no orders for dirty steak over lunchtime but the charcoal smoldered on regardless. 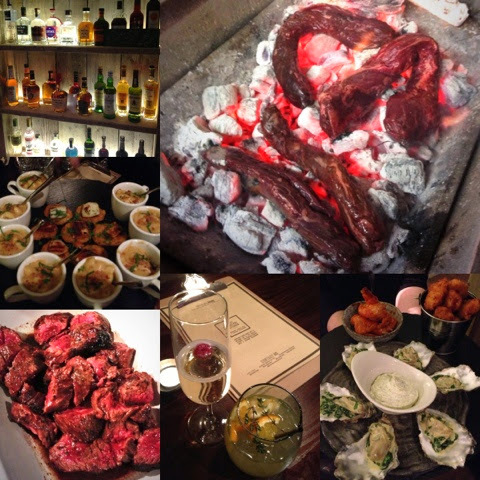 If you can't stand the heat, The Adelphi Kitchen is not the place to be. The time passed really quickly and soon it was cleandown after lunchtime service, staff lunch (got to be the best in the business!) and further prep. Breadmaking, deserts, veggies, seafood, meat, stocks and sauces all in place for the Saturday night rush. Foodie Loon, boy and girl joined me for dinner at 5pm. I got to leave the kitchen and head to our table to order my meal. Just enough time for a quick swig of G&T before returning to the kitchen to cook my own supper. 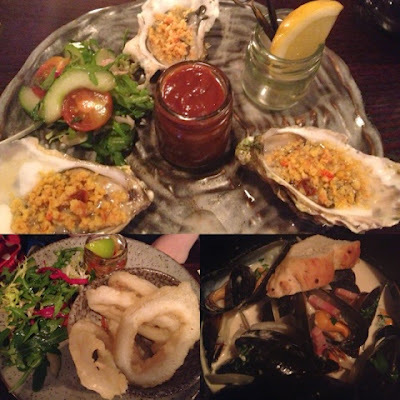 For my starter I opted for Oysters, boy went Bourbon & Lime Tempura Squid with Pineapple & Chilli Chutney and Foodie Loon Shetland Mussels with Scrumpy & Pancetta. Girl was saving herself for the main course so chose bread. Back in the kitchen where I'd never opened an oyster in my life before. Tasha showed me the ropes and taught me a new skill. Squid dipped in Tempura batter and deep fried by me whilst Murray cooked the Mussels. With no dirty diners at lunchtime I couldn't miss out on the chance to cook a Dirty Ribeye for my main course. Foodie Loon went for AK Burger #3, boy had Cures, slow cooked and slow smoked Pulled Pork and girl Hog Mac 'n' Cheese with Crispy Bacon Crumbs. Back to the kitchen where it felt very unnatural to put a steak straight onto the coals. The baste devised by Marcus of Country Woodsmoke only adds to what is already fantastic cut of meat from Davidsons of Inverurie. 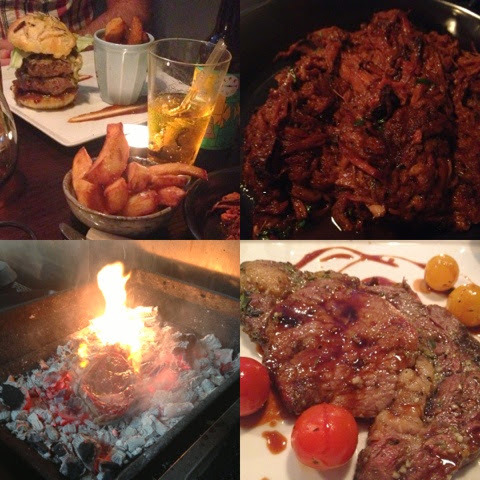 We all thoroughly enjoyed our mains with all four of us sampling each others along with a selection of sides - chunky chips, onion rings, red slaw, baked beans, baby baked potatoes and charcoal greens. I'm not normally one for deserts but felt it would be rude not to sample what I'd seen being prepped earlier. 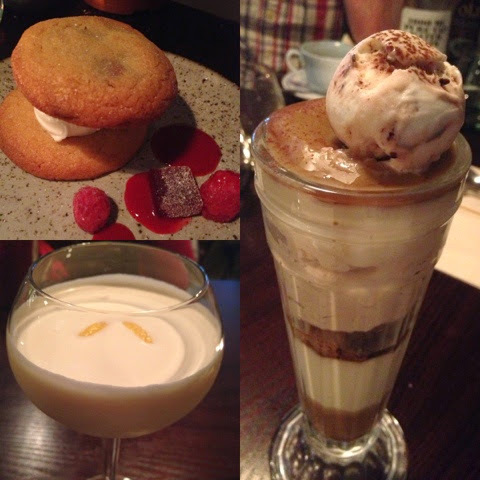 Tiramisu Knickerbocker glory for me, PB&J for boy, girl had the best sorbet ever whilst Foodie Loon had coffee and an extra spoon. In for a penny in for a pound I also had to sample the Lemon Meringue Pie Cocktail that was winking at me from the specials board. It was amazing and a perfect way to round off a fantastic meal and experience. Big thanks to the whole of team AK inside and outside the kitchen for making me so welcome and sharing their knowledge and skills with me. Special thanks for not making me cry. Whilst I headed home with my family to put my feet up they were only half way through a fully booked Saturday night service. Less than a fortnight later I was back at AK. This time hosting my own Foodie Quine Event. When Adelphi launched, Executive Chef Chris Toner said he was committed to following in the footsteps of The Courtyard and La Stella to run foodie events with their suppliers and close friends. I was delighted to be given the opportunity to partner on one such event and in collaboration with Chris we came up with "Favourite Things". Pretty much my ideal menu incorporating all of my favourite foods. The 40 places sold out in less than 24 hours. 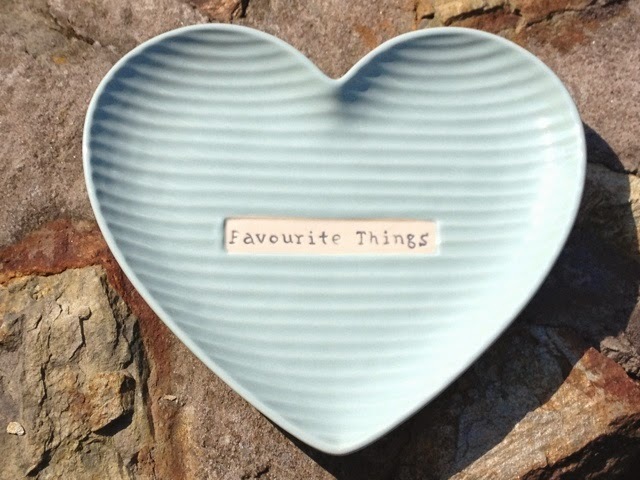 Very pleased to discover that my favourites were also loved by others. My plus one for the event was BFF who presented me with a lovely gift to mark the occasion. As gorgeous and artisan as it looks, I'll share her secret. It was from Asda. I was contributing Rhubarb Gin to the desert part of the evening so brewed up a new batch. We served it in individual jam jars with a raspberry sugar rim. 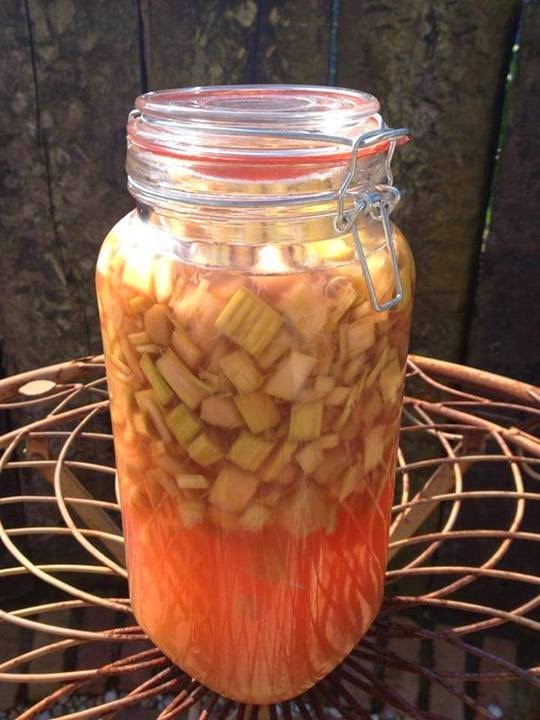 Wash and chop rhubarb and crush with a pestle and mortar or similar. Combine with the sugar and gin in a suitable receptacle Add any desired choice of flavouring. Be patient and keep it somewhere dark for at least a couple of weeks to infuse. Strain, serve and enjoy! 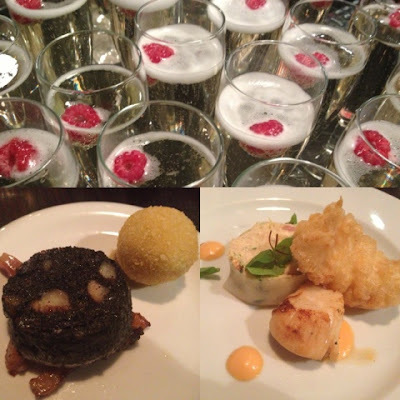 A welcome glass of Prosecco and Elderflower was followed by an Amuse Bouche of Homemade Black Pudding and a deep fried bon bon of Devenick Dairy Blue Cheese. Starter was a seafood sensation. I honestly couldn't choose my favourite between the Crab and the the Tempura Langoustine. Unfortunately we had to alter the advertised main course which meant there was nothing dirty on the menu. The available hangar steak just wan't aged enough to do justice to the dish so was replaced with a mini version of the AK #3 burger. As great as it was it was completely overshadowed by the amazingly tender melt in the mouth pressed shortrib. 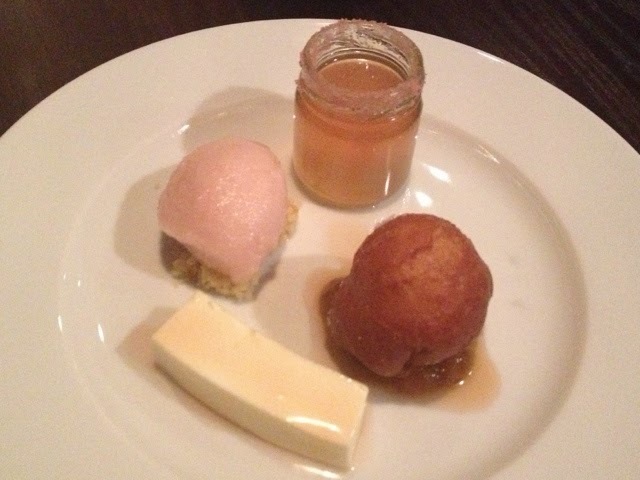 Gin and Rhubarb delights for desert with a tasting plate of sorbet, doughnut, sauce, Gin panna cotta and Rhubarb Gin. Desert perfection in my book. 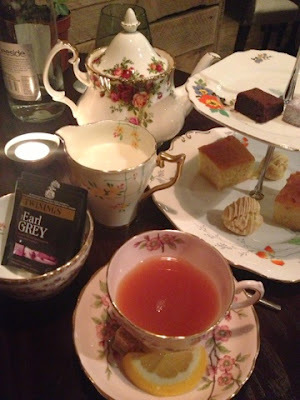 Time for tea to round off the evening and I'd sneaked in another of my passions in the form of vintage crockery provided by Hazel at A Vintage Tea Party. Those who know me will be chuckling at the pictured Earl Grey tea. It is definitely not one of my favourite things. Builders tea every time. 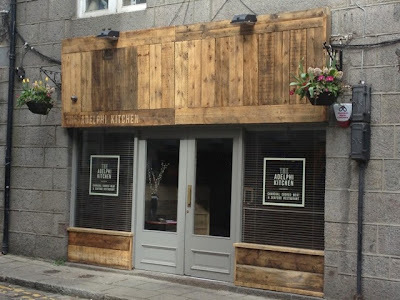 Join the mailing list for special events (perhaps a Foodie Quine #2) and get in touch at hello@theadelphikitchen.co.uk if you fancy giving their "Chef for a Day" experience a shot. 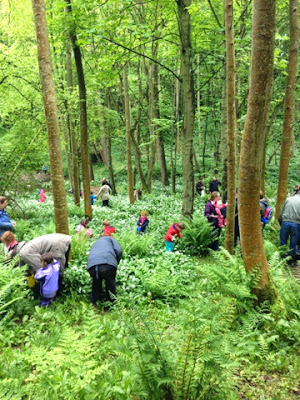 If you went down to Dunnottar Wood's yesterday, you'd have stumbled across 30 families enjoying a Garlic Bear Hunt. 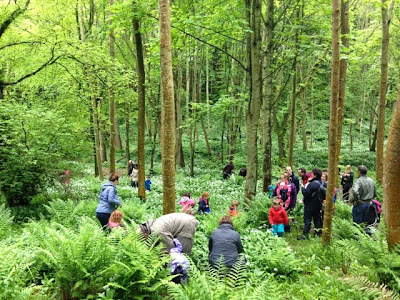 Over two sessions more than 100 adults and kids joined Mandy from Mud Pies and myself for a fantastic spring adventure full of fun, foraging and food. The weather could have been kinder but no spirits were dampened as everyone was equiped with wellies, waterproofs and lots of enthusiasm. 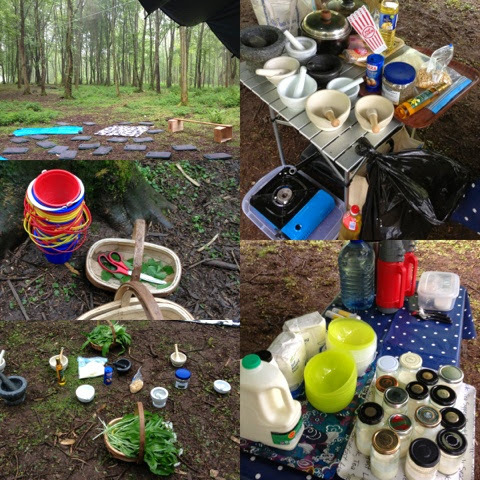 Base camp was established with help from the Dunnottar Bodgers group who provided us with canopy, fire pit, advice and a wonderful display of their traditional woodworking skills. Armed with buckets and bags we headed off on our Bear Hunt. 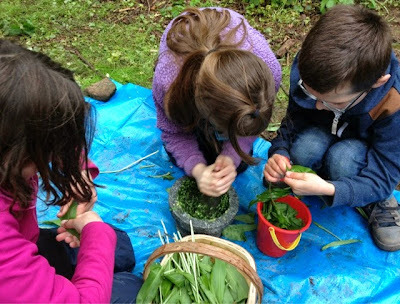 Searching for cuddly bears in the woods and stinky bear garlic. Buckets were filled with bears, leaves, sticks and stones as we wandered via the Shell Housie down to the Glaslaw Burn and saw and smelt the swathes of wild garlic. The garlic was very easy to spot as it was in full flower. Buckets and Bags were filled and the next mission commenced. 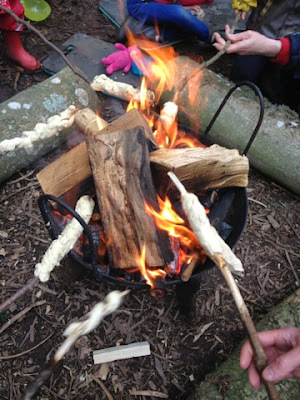 The quest to find the perfect stick to cook damper bread and toast marshmallows on. 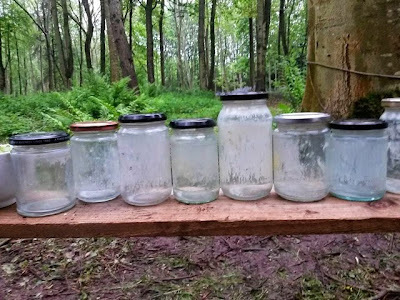 Back to base camp and time to get shaking and making butter in jam jars. Things got very competitive at this point with the Dads in particular engaging in vigorous efforts to be the first to separate the butter and the buttermilk. Pesto Pounding came next. 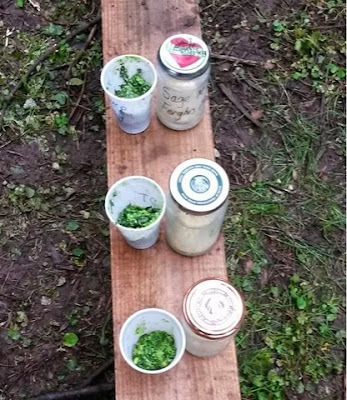 Wild Garlic, salt, pepper, oil, parmesan cheese and pine nuts ground together in perfect proportions to make each families individual secret pesto recipe. Thanks to all my friends who rallied round and lent me an assortment of Pestle and Mortars for the day. Promise I'll give them a good wash out before returning. Whilst one half of the group made pesto the other half made Damper Bread. Self Raising Flour and a pinch of salt mixed to a dough with milk. Rolled into a 'snake' and wrapped around the end of a carefully chosen and peeled stick before cooking over the fire. Time to start eating at last. Dampers were spread with butter and pesto, corn was popped and origami pouches made to hold it in, marshmallows were toasted and all was washed down with tea, coffee, milk and blackcurrant squash. 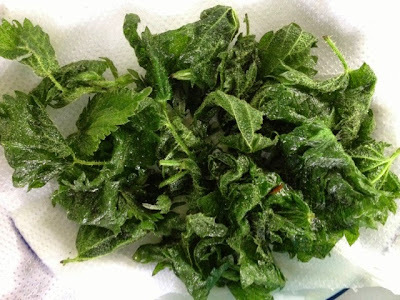 Final foodie treat of the day was Nettle Crisps. These proved to be a real talking point. 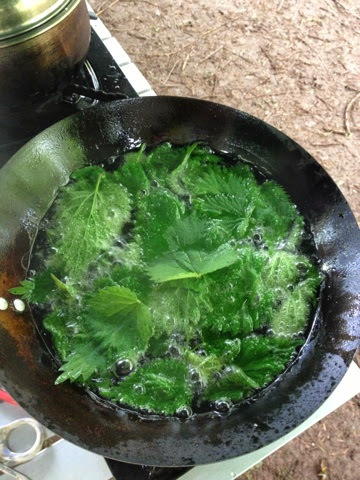 Simply deep fried nettles. Great on their own or with a sprinkle of either salt or sugar. Promise they won't sting your mouth. 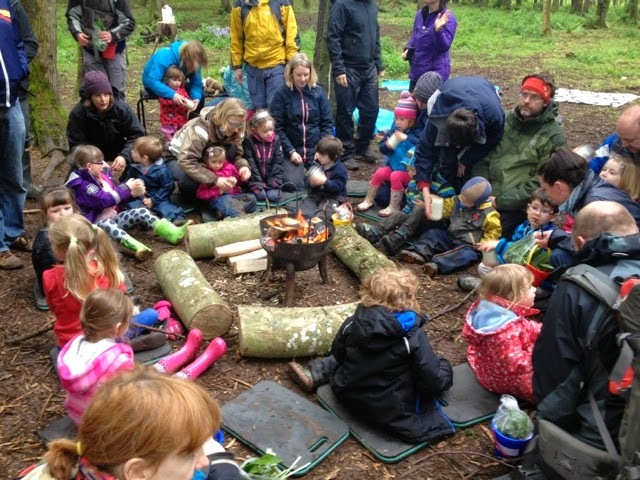 Thanks so much to everyone who came along to our first joint Mud Pies & Foodie Quine Event. Myself and Mandy had a great time and from the feedback we've received it seems like the participants did too. Plans are already being made for further Nature Fun for the Adventuresome with a Foodie slant. Next on our agenda is a Summer Blaeberry Bash followed by an Autumnal Bramble Ramble. Like the Mud Pies and Foodie Quine Facebook pages to be kept posted with what we're up to. 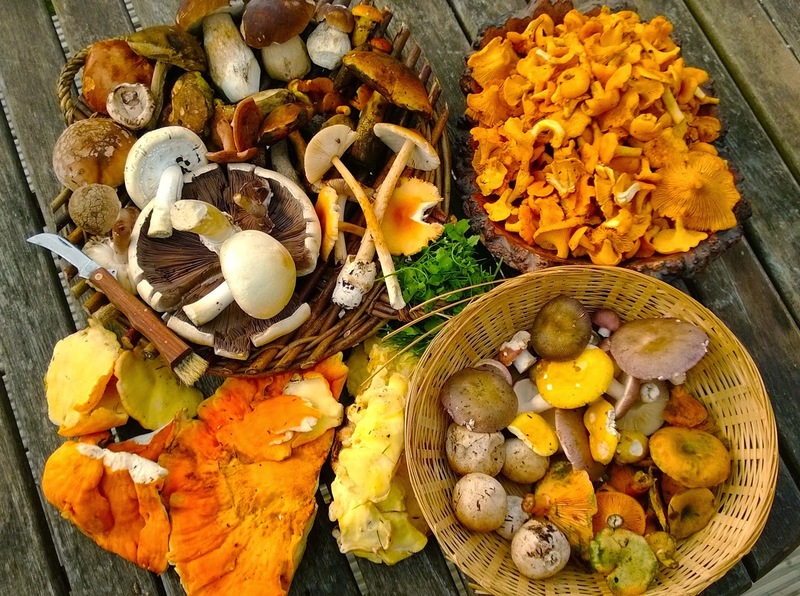 Join Aberdeen food blogger Claire Jessiman and expert forager, and long-term fungi obsessive, Mark Williams of Galloway Wild Foods for an amazing journey into the sometimes deadly, occasionally delicious, and always fascinating world of fungi. 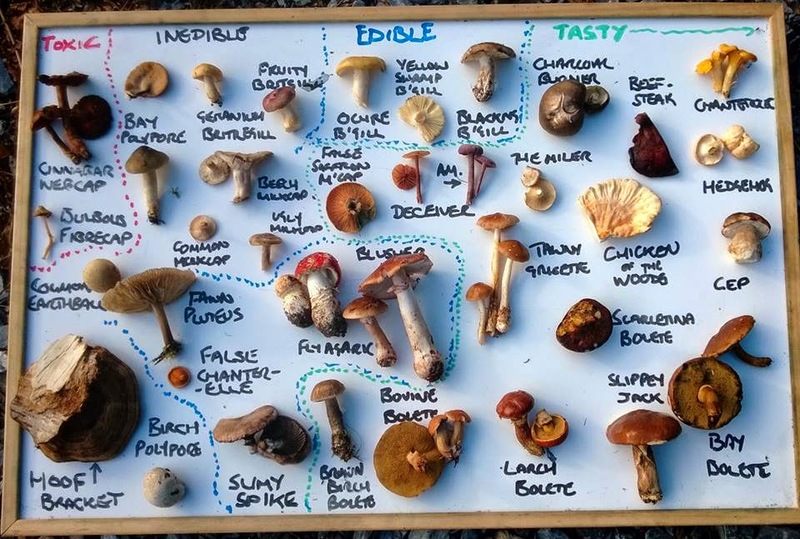 Mark has selected a fascinating area of woodland in easy reach of Aberdeen (< 30 minutes drive to the west of the city) with an amazing diversity of trees and habitats that will give us the best possible chance of learning about a wide range of edible, poisonous and useful fungi. 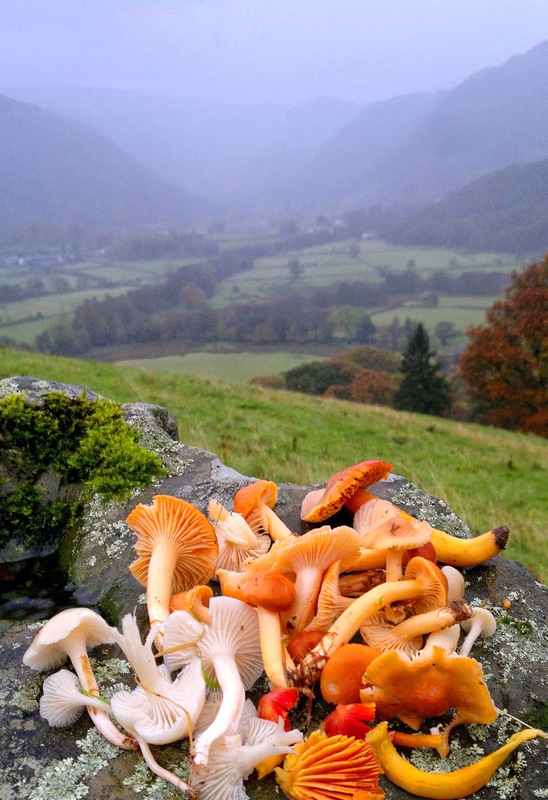 While it is never possible to say exactly what fungi we will find, we can be assured of at least 30 species. Up to 2 miles over about 2.5 hours gentle walking, mostly on easy paths, sometimes muddy, with occasional options for the adventurous to delve into the undergrowth! Suitable for children over 8 and adults of moderate fitness. Wild tasters and treats during the walk from Mark and Claire. 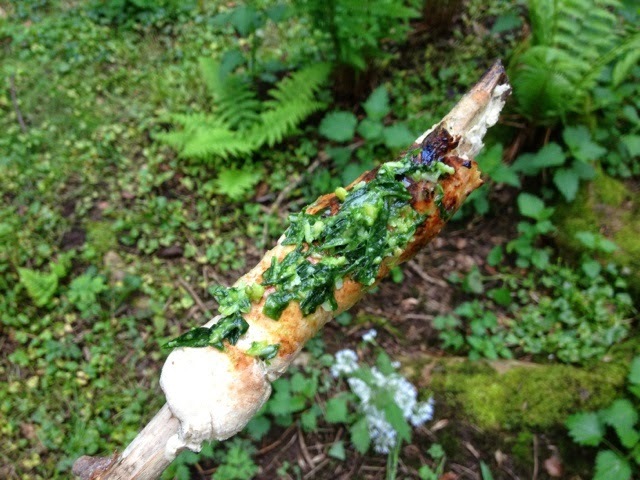 A wild cook-in in the forest afterwards (1 hour) - a chance to taste some of the wild food we have encountered. Please note - this is not a full meal. PLEASE NOTE: There are no toilets or shelter at the location - please come prepared for 4 hours in the woods. 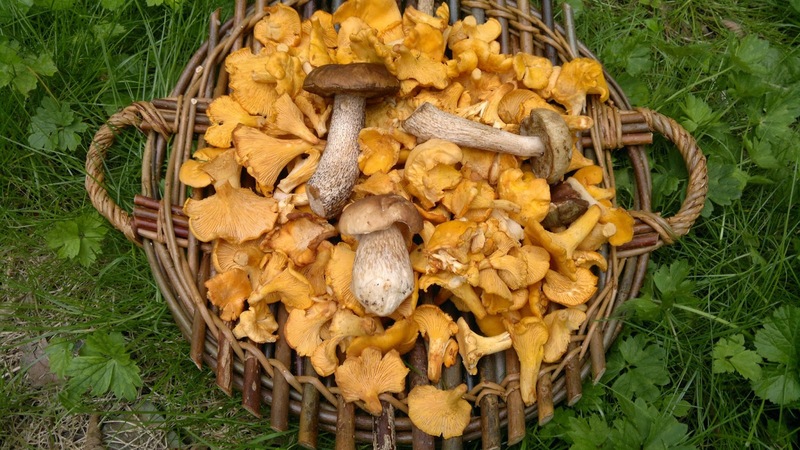 This means: stout footwear (wellies or walking boots), waterproofs, warm clothes, drinks, snacks. Your enjoyment may also be enhanced by bringing a camera, notebook, penknife, cloth bag or basket. Please be aware that no refunds will be issued for this event in any circumstance other than its cancellation. Mmmmm Cheese! My absolute favourite food. 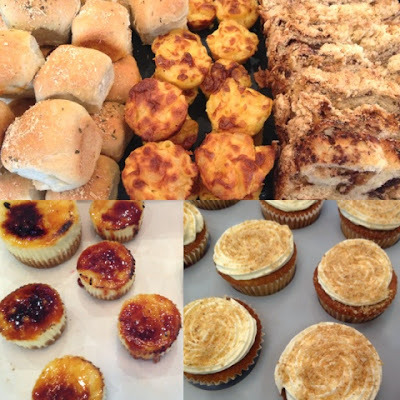 Last year's Fromage Fest at Aberdeen's Pinnies & Petticoats Baking Club was one of our most popular meets. What to make this time round? I swithered over various options but macaroni cheese kept niggling at the back of my mind and in the end I succumbed and opted to attempt a giant pimped up version of a Scottish favourite. 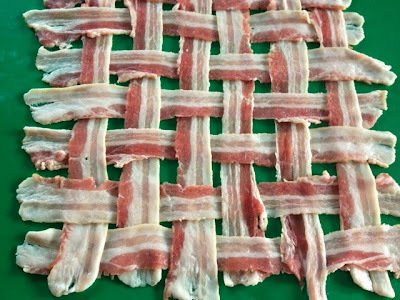 First weave your bacon. (Any recipe that starts with this instruction has got to be good!) Before weaving commenced I stretched the rashers with the back of a knife. I wove on a thin flexible chopping board so that I could easily transfer it at a later stage to the top of the pie by inverting the board. Next make your pastry. I put all my ingredients in the food processor and pulsed until they came together. Add the water gradually as depending upon the size of your egg you may not need the full amount. Wrap in clingfilm and refrigerate for 30 mins before using it to line a metal 26cm loose bottomed flan case. Bake blind for 15-20 minutes at 190 degrees C.
Cook macaroni according to packet instructions and drain. Make the bechamel sauce using either the roux or all in one method. Once thickened add 200g of the grated cheese, mustard powder and seasoning. 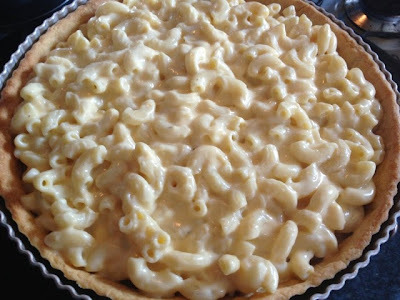 Mix the pasta into the sauce, pour into the blind baked flan case and top with the remaining 50g of cheese. 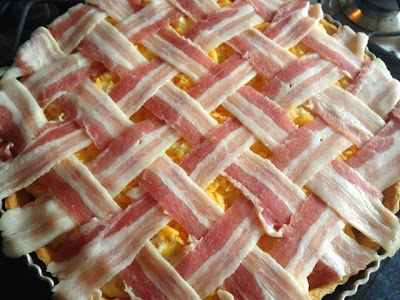 Carefully cover the pie with the lattice topping. There was a lot of overhang, which I was tempted to trim but in retrospect I'm very glad that I didn't. Pop the pie back in the oven for a further 10 minutes. At this point I could see we had considerable shrinkage and we also had some pretty serious curling going on at the edges. In an attempt to rectify I placed a metal tray on the top and gave it a further 10 minutes. 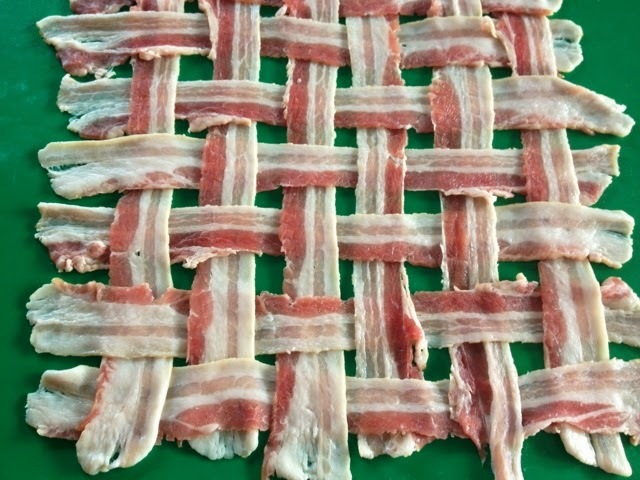 The end result was a square of woven bacon on top of a circular pie. It almost looked as if it were meant to be. Not quite sure what the answer to this is. 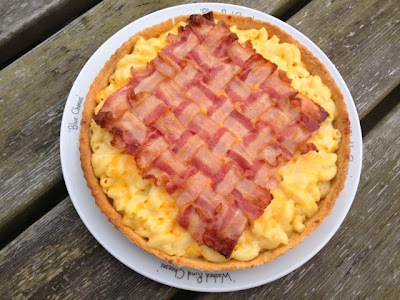 I guess a smaller flan tin would be more practical than going larger on the bacon. Despite the square peg in a round hole looks, it tasted amazing. 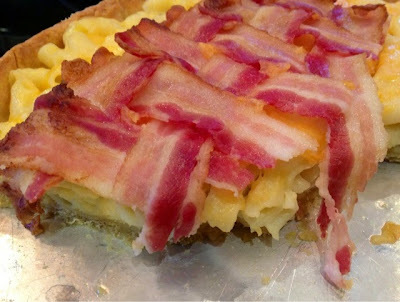 Sooo cheesy with fantastically crumbly pastry and not a soggy bottom to be seen. It got the thumbs up all round at our Fromage Feast. The turnout on the night was actually one of the smallest we've had at Pinnies & Petticoats in a long while. This seemed to be down to a combination of holidays and work/family commitments rather than - shock horror - people not loving cheese. We still had a great collection of cheesy cakes and bakes to get through including some non photographed potted stilton, fruit cheese and chilli jam. The next Pinnies & Petticoats Aberdeen Baking Club is scheduled for 18th June with the theme of Commonwealth Games - Bake for Victory. 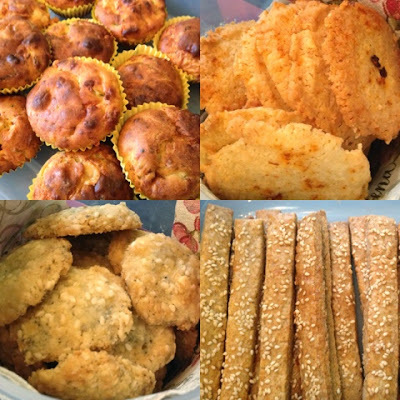 New bakers are always welcome - we are fun, friendly and non competitive with absolutely no rules. Countries are available for allocation on a first come, first served basis. Pick a country and bake something from it. I've chosen Trinidad and Tobago and now I'm on the lookout for somewhere in Aberdeen that sells Cassava. Sometimes you hear about a business idea and you know straight away that it's going to be a success. 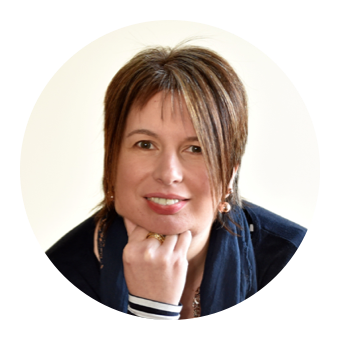 Towards the end of last year I was at a workshop at Aberdeen Business Gateway. To kick things off we went round the room introducing ourselves and our businesses. 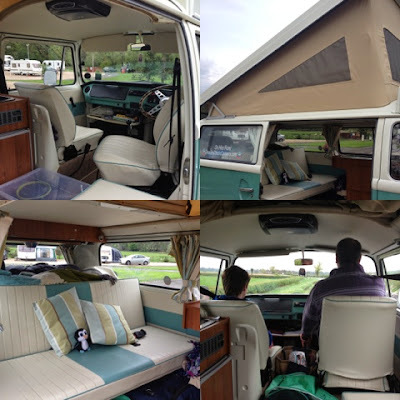 As soon as I heard about Deeside Classic Campers I was smitten. 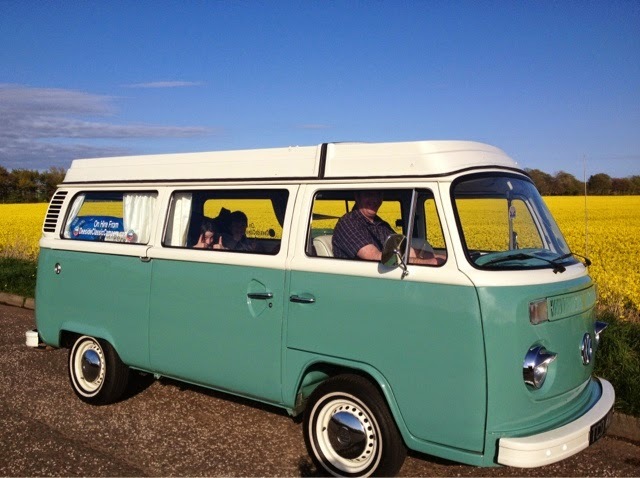 Show quality, stunningly restored and beautifully appointed VW Camper Vans for hire in Finzean, Aberdeenshire. How soon could I go on a road trip? As it turned out we had to wait a wee while as Hamish was still undergoing his six million dollar man rebuild. Fast forward a few months to the May bank holiday weekend and myself, boy and girl set off to collect Hamish from his home in Royal Deeside. As we followed the sat nav directions there were screams from the back seat when they spotted him in the driveway. The sun was shining and he looked absolutely immaculate. Claire and Martin greeted us and we got a full run down of how to drive him, pop up his top and a veritable grand tour of everything else we needed to know. He certainly takes a wee bit of getting used to in terms of driving. The steering wheel is huge, he's not keen on tight corners, gear changes need to be slow and deliberate and he's a tortoise as opposed to a hare. However he's been updated with power steering which makes a huge difference and you very soon get used to all his little quirks. 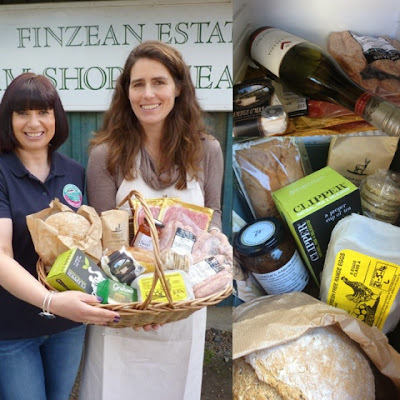 To send us on our way was a luxury hamper of goodies from Finzean Estate Farm Shop. 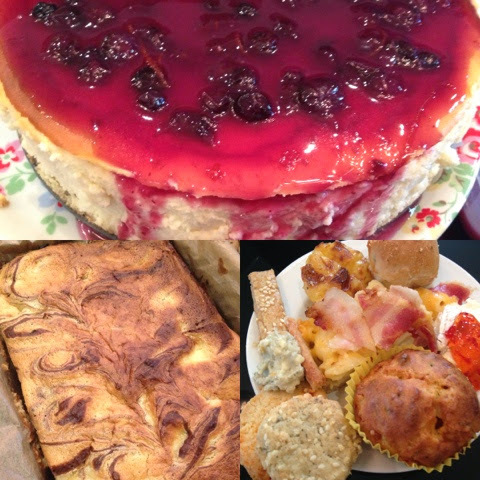 Sausages, bacon, homemade bread, cake, eggs, tea, coffee, butter, cheese, marmalade, oatcakes and a bottle of wine. Our first night was spent at Tayview Caravan Park in Monifieth. Errecting the awning was left to the boys and was much trickier than the instruction video made it look. However once up it provided valuable additional space. Much argument over who would sleep where. Boy and girl won the toss and chose upstairs. 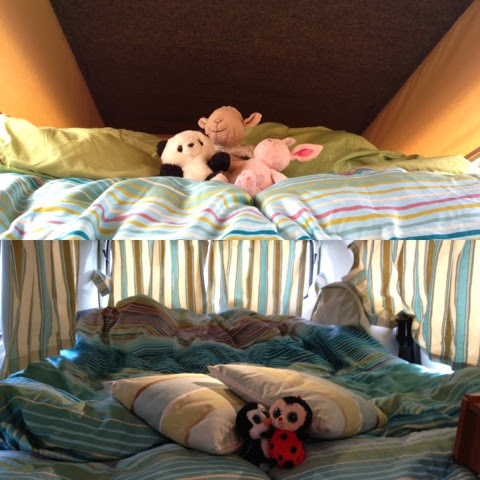 Both beds were spacious, cosy and comfy. Electric hook up, three pin plug points and a wee fan heater meant you could have a boost of heat if needed. Two gas rings meant it had to be a cooked breakfast and a chance to sample some of the goodies from our foodie hamper. 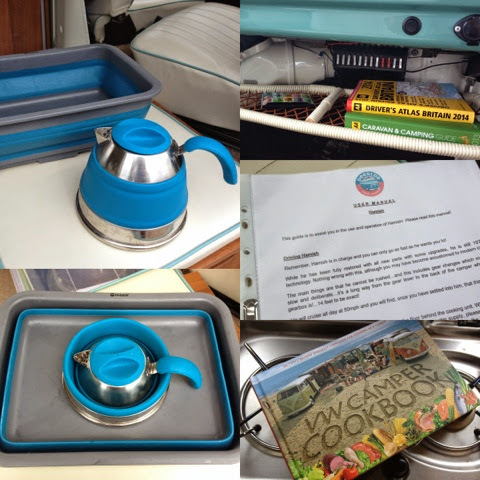 Time for two of my favourite things in the camper to come in to use. Collapsible kettle and washing up bowl. These are genius. 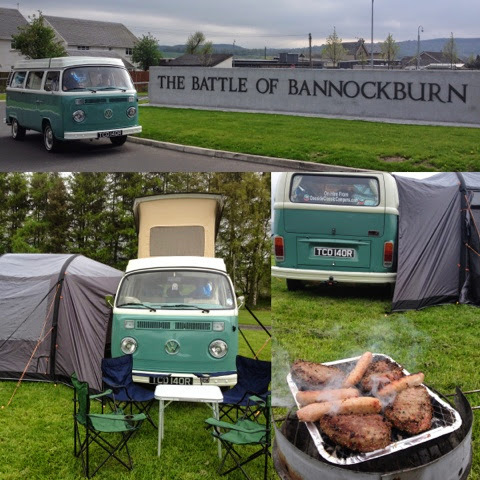 After breakfast we were on the road again heading to the new NTS Battle of Bannockburn Visitor Centre. Arriving half an hour before our Battle Room experience we lunched in the car park. 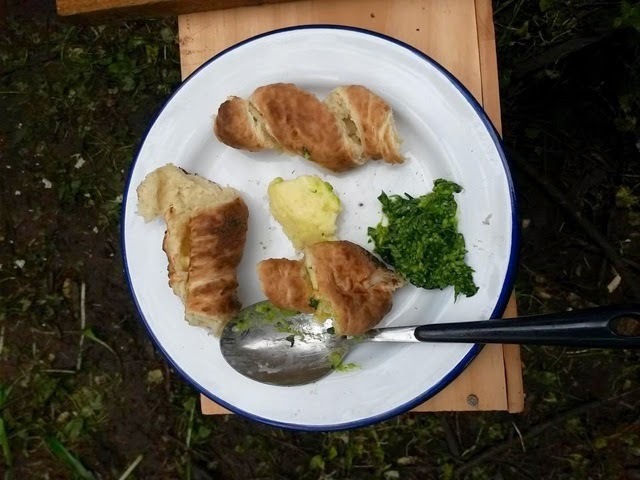 All our meals and snacks throughout the whole weekend were eaten in Hamish. Partly due to the novelty factor but also because it was so convenient to be able to do so. It was a fantastic money saver too. 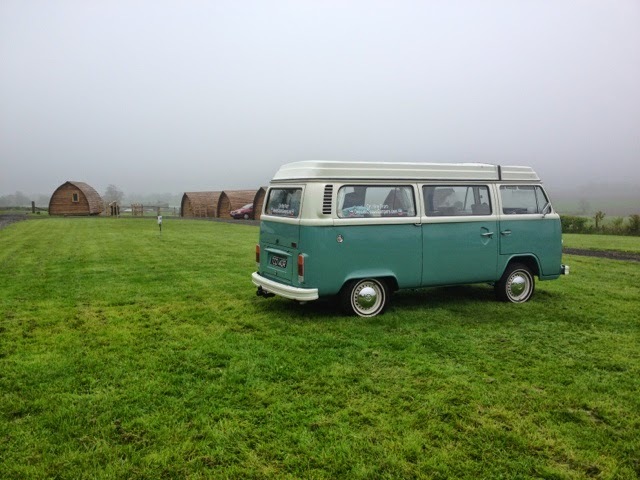 Our Saturday night campsite was Mains Farm Wigwams where Hamish was outstanding in his field. After erecting the awning (in a considerably shorter time) we took a wander up into the village of Thornhill and enjoyed a couple of drinks at the fantastically friendly Lion & Unicorn pub before returning to light a BBQ. We were just finishing our final sausages when the heavens opened so we retired for the night to watch Frozen on the ceiling mounted DVD player. Do you wanna build a snowman? 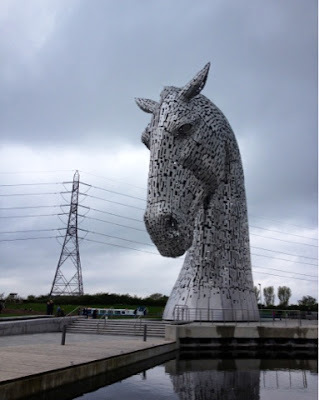 Sunday took us to Scotland's newest visitor attraction. 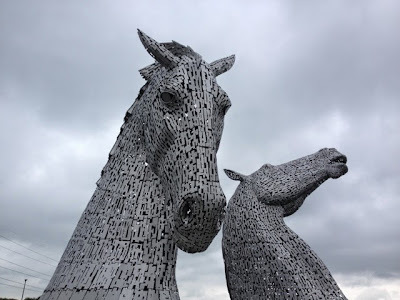 The Kelpies. We were absolutely blown away by these amazing creatures. We did the tour and got to go inside the downward looking Kelpie. At 30m high they are a fantastically imposing and mesmorising work of art. 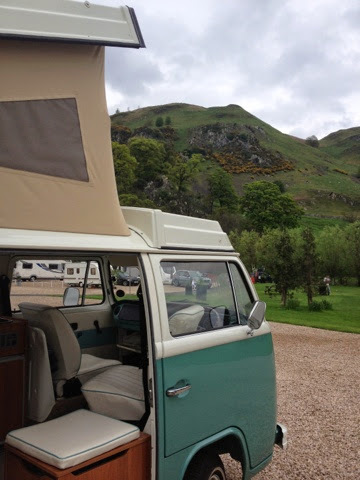 Our final campsite was Witches Craig tucked below the picturesque Ochil Hills and and overlooked by the historic Wallace Monument. Very close to Bramble Bield where we went Big Fat Gypsy Glamping. 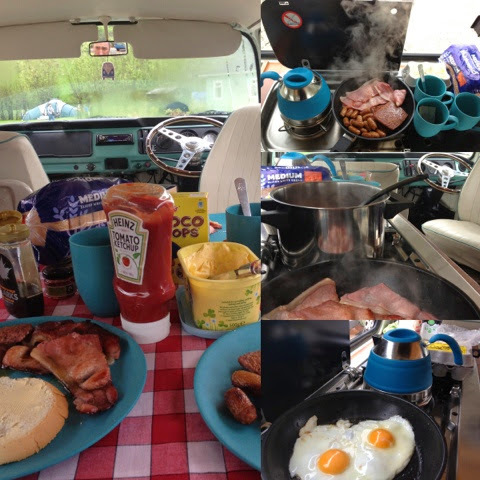 Our final cooked breakfast in Hamish was a whopper. Using up everything left in the fridge. Time to head back to Deeside and with a little encouragement "come on Hamish, you can do it" we made it over the Cairn O'Mount. Will sign off with the 5* review that I left on the Deeside Classic Campers Facebook Page. It sums up our weekend perfectly. We spent the May weekend with Hamish and absolutely loved the whole VW Camper experience from start to finish (didn't want to give him back!) I really can't recommend it enough. We had an amazing time! Hamish was fantastically well equipped with everything you could possibly need. The awning was a very useful addition but even without it he's surprisingly spacious. Beds are cosy and comfy both upstairs and downstairs. He's a wee bit quirky to drive but you soon get used to him. He can't be rushed but you soon discover that Hamish speed is speedy enough. If anyone fancies doing it - book it - you won't be disappointed. Expect many envious glances, cheery waves and happy honks along the way. Can't wait to do it all over again in Fergus! 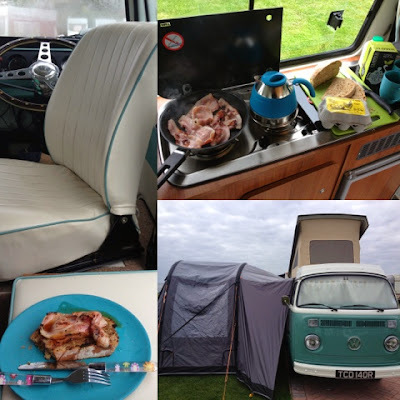 Disclaimer : Deeside Classic Campers provided us with the Campervan Awning, Luxury Hamper and Bedding/Linnen Packs free of charge. We paid for the weekend hire and our insurance. All views expressed are my own.